Since MMP and TP could not make it to the party on the weekend, we all went out together on Monday. 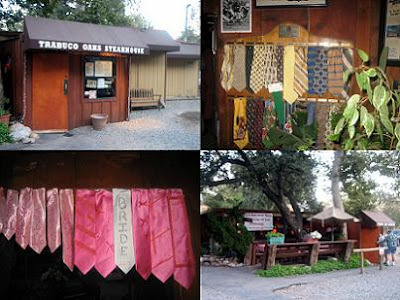 I wanted to try something new and I had my eye on Trabuco Oaks Steakhouse. Little did I know that this place is located far Far FAR away in Boonieville! It was a long arduous drive that was scenic but really long. We were all looking at each other in the car wondering how anything could be out here in the boonies! Eventually we got there and it was truly desolate. 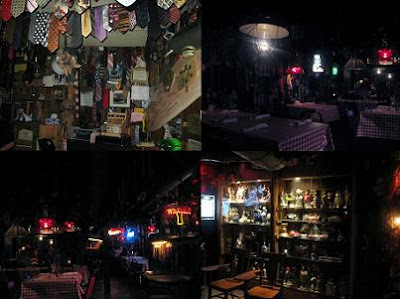 I am attaching a photo to show you what the restaurant faces! You park on gravel and there is only a tiny General Store next to the place. We often joked that they must raise their own cattle and everything. How do they get anything out here? I say they have their own farm and land that they manage out here. The restaurant is so in touch with the land that the ground is built around trees so the floor is not very flat. TP really liked the decor of the ties everywhere. It really gives it an extra touch to see all the ties that people leave behind. Bread and Salad came with our meals. The bread is nicely grilled and lightly buttered. It has a simplistic but savory taste. They make their own salad dressing that is really light and simple on the fresh greens. I think I was hungry so this all tasted pretty good. All of our dishes are broiled over Bob Kittleman's mesquite charcoal fire pit, no gas or electricity. TP ordered the Chicken Brochette. It's 8 oz. of skinless Chicken Breast chunks on two skewers with Bell Peppers, Onions, Mushrooms, and Special BBQ Sauce. TP liked the chicken. MMP ordered the Li'l Wrangler. It's 8 oz. Top Sirloin broiled. MMP said that she thought the meat was only so-so. I think that sirloin is usually a tougher meat and texture. The piece she had was quite tiny and definitely would not have filled me up. For my main dish I decided to get the Rustler. It's a 12 oz. Filet broiled. I asked for it Medium-Rare and it was cooked nicely. The meat was thick and tender. I actually really enjoyed the filet mignon. Lately I have been eating filet mignons at top restaurants and I have not been that impressed. The filet here was tender and flavorful. It could use some more seasoning, but I just used their special BBQ sauce. The Fries are pretty tasty and fried nicely. All in all I enjoyed my steak and the service was fine. I don't know if I would ever drive THAT FAR again for food. At least we had an adventure and enjoyed each other's company. The only thing I found disgusting was the behavior of the people sitting next to us. This family next to us was spitting on the floor in our direction. I am sorry but that is just totally unacceptable. If that is the uncouth clientèle they have then I wouldn't want to be dining in the same facility. I know the restaurant is not to blame, but what they attract or accept bothers me a little. Food-wise, it was not bad but nothing I'd die for or be willing to drive so far for.